In the most violent country in the world, youth is killing youth, the state is in a state of war and extrajudicial killings are on the rise. This cannot continue unabated. Español. 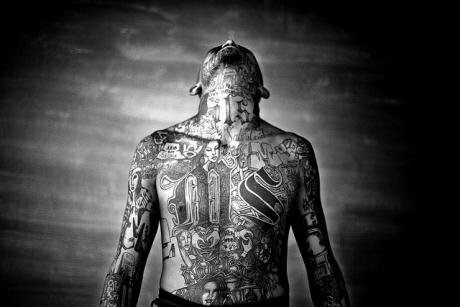 A members of the Mara Salvatrucha gang displays his tattoos inside the Chelatenango prison in El Salvador. Moisen Saman/Flickr. Some rights reserved. According to what investigative journalists have been able to piece together from crime scene photos, forensic reports and witness accounts, including his own mother’s, Dennis was shot in the back of the head after a heavily armed police commando stormed the farm one late night back in March 2015. The cops had being tipped off that a small group of Mara Salvatrucha (MS-13) gang members had sought refuge in the farm in recent days fleeing police raids in their own local barrios. That night, the Salvadoran police killed 8 young men and women, including Dennis and 16 year-old Sonia Guerrero, who, according to the reporters covering the story, was not a gang member either. Sonia was there because she was romantically involved with one of the six gang members the police massacred that night. The forensic report established that the single shot wound in her mouth shattered her spine as she knelt. The account of the carnage—which appeared in the digital newspaper El Faro—underscores what some observers are alleging is now a common occurrence in El Salvador. Other press reports and some human rights activists contend that police are taking the law into their own hands and conducting raids with a take-no-prisoners mentality targeting the youth gangs whose violent ways and criminal acts have brought the entire country to its knees. Violence in El Salvador reached unprecedented levels in 2015. The 481 murders reported in March of last year—when the San Blas massacre took place—marked a level of bloodshed unseen since the end of the country´s 12 year civil conflict (1980-1992). But that somber figure from March was subsequently—and incredibly—surpassed in May (622), in June (677) and in August (907). According to year-end police statistics, 6,670 people died violently in El Salvador during the past year, up from 3,942 in 2014. This bloodshed has made El Salvador the most violent country in the world. Its current homicide rate of 103 murders per 100,000 inhabitants, according to recent data from InSight Crime, has topped even that of neighboring Honduras that had held, until recently, that infamous title. According to the government, the high number of violent deaths was due to an increase in clashes between rivals MS-13 and Eighteenth Street (M-18) gangs, and between the country´s security forces and the gangs. Gang membership in the country is estimated to be around 70 thousand strong. As the State confronts youth gangs, police officers have become direct targets in this senseless cycle of deadly violence. After the government announced an offensive on gangs in early 2015, gang leaders countered by threatening to target members of the police and the armed forces, who, by law, play a supporting role in policing duties. In 2015 alone, 59 police officers were killed, representing a 55% increase from 2014. Sixteen soldiers were also killed in armed attacks perpetrated by gangs. In a further escalation of the violence, the government also loosened up the rules of engagement for police and the army thus making it easier for them to use their weapons to “defend themselves” against gangs. This unleashed an all-out war in which young police agents and army troops, and young gang-bangers are killing themselves. In the first seven months of 2015, the country saw over 150 shootouts between police and gangs resulting in the killing of many suspected gang members. Recent media reports and year-end government data also reveals an increase in “multiple homicides,” which are defined as cases in which there are two or more deadly victims. There were 94 reported massacres between 2012 and 2014. In 2015 alone, there were 106 multiple homicides—like the San Blas massacre—which resulted in just over 400 deadly victims. Witness testimonies state insistently that in many cases, groups of heavily armed men dressed in dark, similar to the clothing worn by the police and the army, used sledgehammers and verbal commands to forcibly enter homes and either take the victims outside to be killed or kill them inside their dwellings. Government officials have denied they conduct or condone these practices. Anecdotal evidence suggests that citizens support the government´s aggressive campaign to exterminate gang members. Traditional media outlets seem sympathetic to the daily tally of gang members being “eliminated,” even though, several incidents reported in the news suggest cases of indiscriminate violence conducted by police and parallel armed groups. The worsening of the violence came after the unraveling of a truce brokered by rival gangs in 2012 which led to a dramatic 40% drop in the murder rate. The truce, which was also secretly facilitated by government actors, lasted about two years but became a contentious political issue in the midst of a hardly fought presidential campaign in 2014. As the truce crumbled, the number of violent deaths began to rise again. Gang leaders and promoters of the truce have been demanding the current government to revive the 2012 truce and to curtail the anti-gang legislation and security measures. Thus, gang-driven violence—including the gang´s own campaign targeting the police and other state actors—is considered to be part of an effort to pressure the government into new negotiations. Similarly, in late July 2015, a gang-enforced four-day public transportation boycott essentially paralyzed the entire country and demonstrated their operational capacity and authority. However, so far the current administration has refused to get involved in any such negotiations, arguing that a fresh truce, aside from being politically unpopular, would require the government to accept excessive gang demands. Indeed, many observers claim that the two-year gang truce involved substantial concessions, including a tacit recognition of the gang’s territorial authority over entire municipalities where they operate. Hence, when the truce started to collapse, the gangs proved to have become bigger, stronger, bolder, and more violent. Thus, the government´s policy thus far has simply been to deploy more police and army troops to areas with heavy gang presence. This has also been accompanied by a process to eliminate legal obstacles for the security forces to be able to fight gangs head on. Despite high expectations that the current government—which took office in June 2014, after a heated election campaign—would be able to act more effectively against crime and violence, public perception points to a big disappointment for the lack of ideas and effective strategies as to how to deal with this mess. Through the use of social media, the population expresses their sentiments of being fed up with the incompetence of consecutive governments to fight criminals. Thus, public opinion polls continue to single out public insecurity as the country´s most pressing challenge. Through its decision, the high court clears the way for the justice system to act on MS-13 and rival Eighteen Street and any other gangs attempting to claim powers that belong to the state and to treat them as terrorists. Their new status as terrorist groups allows the government to fight gangs in a more efficient manner and with better legal tools. The court — that defines terrorism as organized and systematic violence — also gave legislators six months to adapt the penal code to lengthen prison sentences for those found guilty of committing terrorist acts to 60 years in prison. Legislators have also rushed to approve laws that extend prison times for gang members found guilty of killing members of the country’s security forces. In early December 2015, El Salvador´s Human Rights Ombudsman, David Morales, presented the findings of a study on abuses reportedly committed by state security forces, noting an increase in police misconduct. The study reveals that between June 2014 and May 2015, this institution received 2,202 complaints of human rights violations. Of these, 92 percent were against the PNC, the army, and other state institutions responsible for combatting crime. Morales, had also stated in 2014 that his Office’s investigators had identified at least ten homicides cases that bore all the hallmarks of death squad killings. In each case, the victims were gang members and the perpetrators were dressed in black clothing and carried assault rifles. Since 2014, Salvadoran human rights activists have been denouncing that death squads with possible connections with the police have been waging a campaign of “social cleansing” against gangs and suspected gangs members. These allegations suggest that the security forces may be reviving an ill-conceived practice from the country’s past for dealing with political turmoil. This Central American nation has a long and bitter history related to death squad practices. During El Salvador twelve-year internal armed conflict (1980-1992), the country developed a notorious reputation for extra-judicial killings, torture, disappearances, and paramilitary death squads that killed tens of thousands of people. Following the war, a new generation of death squads emerged targeting gangs, politicians, human rights defenders and judicial officials. The most famous of these death squads was the Sombra Negra, or Black Shadow, which was active in the early to mid-1990s but that has resurfaced periodically over the last decade. The Salvadoran media reported in 2014 on Sombra Negra graffiti appearing in several communities as well as on the opening of a Sombra Negra anti-gang web page (Escuadrón Alpha SN, or Black Shadow Alpha Squadron) and a Facebook account with over 14 thousand followers. Similarly, a Facebook account for Héroe Azul El Salvador, or Blue Hero El Salvador (in reference to the PNC´s blue uniforms), apparently set up by police and/or police sympathizers constantly updates and celebrates the “elimination” of gang members. The site, which boasts 185 thousand followers, also posts gruesome pictures of the dead bodies of alleged gang members clearly showing gun shots to head or to the back. The state’s absolute incompetence in dealing with the criminal phenomena in El Salvador has forced the government to resort to extra-legal measures to confront the severe citizen security challenges it faces. In a desperate attempt to show results to a frustrated populace, there is strong, well-documented evidence, that state and other social actors are waging social cleansing campaigns and committing gross human rights violations that are taking the lives of innocent young men and women. In addition to the rising violence, the local media has reported that the army has been forced to dismiss an increasing number of personnel for suspected gang affiliation. This seems to be happening given the army’s increasing role in policing tasks. But this is also a process that has already taken a toll among the rank and file of the police which has undergone periodic purges of suspected gang members that had infiltrated the institution. A recent study by Georgetown University’s Center for Security Studies examines the recent evolution of gangs in El Salvador. The study delves into the question of whether or not the country’s gangs have transformed into more complex organizations capable of articulating a political voice, maintaining an international reach, and effectively confronting the state. While the report concludes that following the crumbling of the truce the gangs have not undergone a process of “collective maturation” into more sophisticated actors, the fact remains that these criminal enterprises have shown enormous resilience and an immense ability to exert pressure on the state and inflict alarming levels of violence on society. The current situation in El Salvador (and other Central American countries) simply cannot continue unabated. More and better efforts must be undertaken in order to dramatically change the present conditions. Similarly, more resources need to be made available to conceive and implement public policies that work and that include robust violence prevention and law enforcement components. Both the Salvadoran state and the international community must work in coordination to muster the necessary funds and technical expertise to start putting a dent in the current state of affairs. In particular, the United States has, what Guillermo Céspedes, former Deputy Mayor of Los Angeles, called a “moral debt,” since both, MS-13 and M-18 gangs, originated in that country, in addition to the role the US played in exacerbating public insecurity in the Central America by deporting hardened criminals during the 1990s that exported to the region the gang culture prevalent in El Salvador today.